I love reading what my sister Virginia Allain uncovers in her research into our family history. Sarilda Ashlock Mikesell was nearly thirty years older than her half-sister, my grandmother, Ruth Vining McGhee. We were a family that had a great tradition of oral history, so it’s odd that I don’t remember ever hearing any stories about her. Shortly after Ruth’s birth, the newly widowed Sarilda, age 29, left Kansas and moved to Oklahoma and then later to Texas, so maybe with distance and the disparity in ages, the connection between the sisters was lost. After she was widowed, she supported her five children as a washerwoman. I’ve seen that with other widows in my Mom’s family line. Losing a husband, the sole bread winner, often pushed a family over the edge into abject poverty in those days. The widow of the late J. H, Mikesell was treated to a generous surprise Sunday evening. When she returned home from a visit of several days in Chetopa township and entered the little home so recently saddened by the death of her husband, she found new paper on the walls and overhead, a carpet which she had recently finished, all sewed together and nicely put down, and the table laden with packages, parcels and bundles of the substantial of life. Such was the method adopted by her many sympathizing neighbor friends who put into deeds their thoughts of love and pity. The pound party occurred and all was in readiness Saturday night for Mrs. Mikesell’s appearance but the inclement weather made her return home impossible, until Sunday afternoon. The great source of Good certainly has his abiding place in the hearts of many Neodesha people, for it has been our observation that such incidents as this have been more numerous here than in any of the surrounding cities during the past few years. 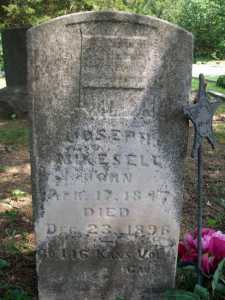 It was just a few days before Christmas in 1896 when Joseph Harvey Mikesell suddenly died. The news appeared in The Neodesha Daily Sun, (Neodesha, Kansas) 24 Dec 1896, page 2. His wife Sarilda Jane Ashlock was my grandmother, Ruth Vining’s half-sister. They were 30 years apart in age, as Ruth was the youngest of the large family. Joseph was described by the Wilson County Sun as a fisherman and trapper. He was just returning with wagon and team from a two or three weeks trapping expedition up the river. He had stopped at Dun station to sell his hides when he was stricken with apoplexy and died in C. S. Adell’s store, about nine o’clock at night. Posted in Family History, Kansas, UncategorizedTagged Neodesha, Sarilda Ashlock MikesellBookmark the permalink. Thanks for the education about the ‘Pound Party’. What a wonderful, supportive community!